Planetary alignment photo opportunity. The month of May provides an excellent opportunity for astrophotographers to catch the alignment of four naked-eye planets: Mercury, Venus, Mars and Jupiter. In the southern hemisphere these four planets are visible just before sunrise over the next few weeks. 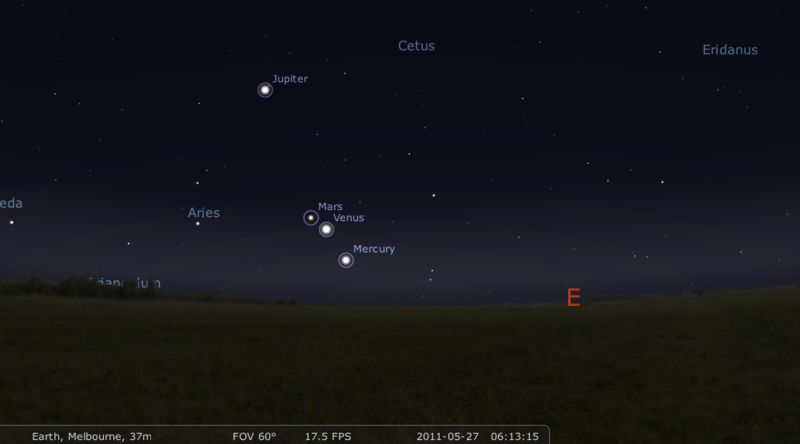 Planetary alignment as seen from Melbourne at 6am in the eastern sky on 27 April 2011. Click for larger version. Made with Stellarium. A NASA press release on 4 May has announced that the Gravity Probe B mission has confirmed two predictions of Einstein’s general theory of relativity: the geodetic effect which hypothesizes that spacetime is distorted by massive objects, and frame dragging which occurs when spinning massive objects pull on spacetime as they rotate. The Gravity Probe B satellite was launched in 2004 and the initial science phase of the operation ran for 1.5 years. Data analysis, however, has taken 5 years to complete. According to the theory of relativity, three-dimensional space and time are connected as a four-dimensional “spacetime”. A massive object, like the Earth, causes a dimple in the fabric of spacetime, and “gravity” is the motion of objects following the curved lines of through the dimple of spacetime. But when the massive object rotates, like the Earth, the spinning motion twists the dimple and creates a vortex in spacetime through a process called “frame dragging”. Frame dragging was predicted by Austrian physicists Josef Lense and Hans Thirring in 1918 as a consequence of Einstein theory of relativity. Were the first stars super-fast “spinstars”? A new study suggests that the first stars in the Universe were not only massive but also fast rotators. Massive stars live fast and die young, surviving for less than 30 million years, making them tricky to study. But when they die in a supernova explosion, they eject their synthesised heavy elements back into the interstellar medium, which is recycled in future generations of stars. Low mass stars, particularly those less massive than the Sun, live a very long time and can contain elements produced by the first generation of stars. Thus old low mass stars can be used to provide insights into the lives of the first stars. Cristina Chiappini of the Institute for Astrophysics in Potsdam and collaborators have used the ESO Very Large Telescope to study the composition of stars in one of the Milky Way’s oldest globular clusters, NGC6522. They found unusually high levels of the heavy elements strontium (Sr) and yttrium (Y) in the surfaces of eight stars in NGC6522, and by studying the ratio of elements in these old stars, they suggest that the first massive stars must have very rapid rotators to produce the internal mixing required to produce these rare heavy elements. Molecular clouds are the sites of star formation, but the exact conditions required to trigger the onset of star formation is still poorly understood. Observations from infrared satellites have shown that molecular clouds have a filamentary structure and that star preferentially form along the filaments. But the formation of the filaments themselves is not well understood. Gravity, magnetic fields and large-scale turbulence have all been proposed to explain the filamentary structure in molecular clouds. One theory suggests that prestellar cores form via a two step process: large-scale magnetohydrodynamic (MHD) turbulence first generates a network of filaments in the interstellar medium (ISM) and then the densest filaments fragment via gravitational instabilities into prestellar cores. Left: 3-color Herschel image of IC 5146. Red = SPIRE 500 μm + 350 μm, green = SPIRE 250 μm + PACS 160 μm, blue = PACS 70 μm. Right: SPIRE 250 μm image of IC 5146. It is a pleasure to announce some SAO alumni news this week! SAO’s own Graduate Certificate graduant Jeff Stanger (who completed his degree in 2005) has just published a paper in the Publications of the Astronomical Society of Australia (PASA) on the planetary nebula K 1-6. Planetary nebulae are a brief phase in the evolution of low to intermediate mass stars (< 8 Msun) following the asymptotic giant branch (AGB) phase. Shell burning during the AGB phase result in pulsations that drive enormous mass loss, and the star effectively ejects its outer envelope. As the mass-loss rate drops, the outer envelope detaches from the star and the stellar core becomes visible. As the exposed core increases in temperature, its UV radiation ionises the surrounding ejected material, which lights up and becomes visible in the optical as a planetary nebula. The morphology of planetary nebulae are extremely diverse and are likely driven by the stellar properties, whether the central star is in fact a binary, and the episodic nature of the AGB mass-loss and hence the clumpiness of the ejected envelope material. The NASA spacecraft MESSENGER successfully completed a 15-minute engine burn today to place it orbit about Mercury, making it the first spacecraft to orbit our inner-most planet. The Mariner 10 space craft completed three fly-bys of Mercury in 1974 and 1975, mapping just under half the planetary surface. MESSENGER completed two fly-bys in 2008 and 2009, providing stunning new images of this least explored planet. 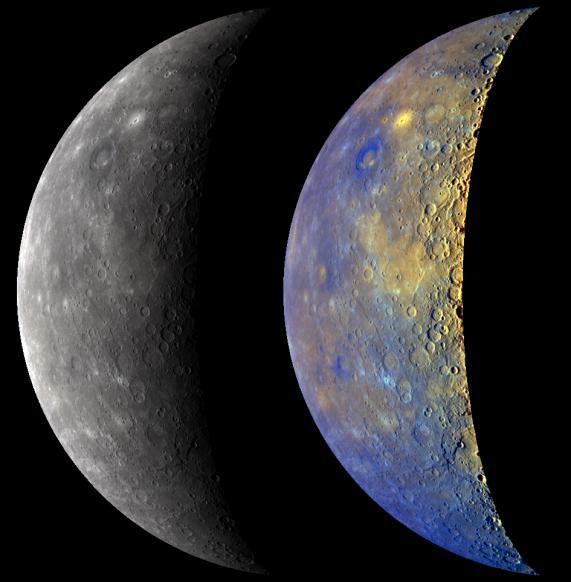 MESSENGER was launched in August 2004, completing two fly-bys of Venus in 2006 and 2007, reaching Mercury for its first fly-by in January 2008. So why has it taken another three years to get into orbit?? 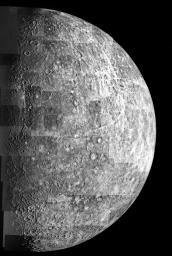 Being the closest planet to the Sun, Mercury’s orbit is very fast and the spacecraft needed to “catch up” with the planet. This required gravity assists from both Venus and Mercury. Each flyby increased the average speed relative to the sun, and decreased MESSENGER’s speed relative to Mercury. For an animation of the orbit insertion maneuver, click here. It’s life Jim…. or is it?